How Tanzania’s farmers are growing their way out of food poverty by consuming more data. Don’t go with your gut feeling. Go with the data. That’s what up to 38 million Tanzanian farmers are learning. Working with a local seed company using soil and rain sensors connected to Hiber’s nano satellites, farmers can maximise yields like never before. Why? Farming in Tanzania used to be extremely tough. Yields were traditionally low and harvests poor. Often due to inferior quality seeds and not understanding and predicting the weather and soil conditions. There was always the threat of crops being wiped out by disease or pests. And even if farmers did have a good season, export limitations meant they couldn’t sell their surplus staple crops like rice or potatoes. 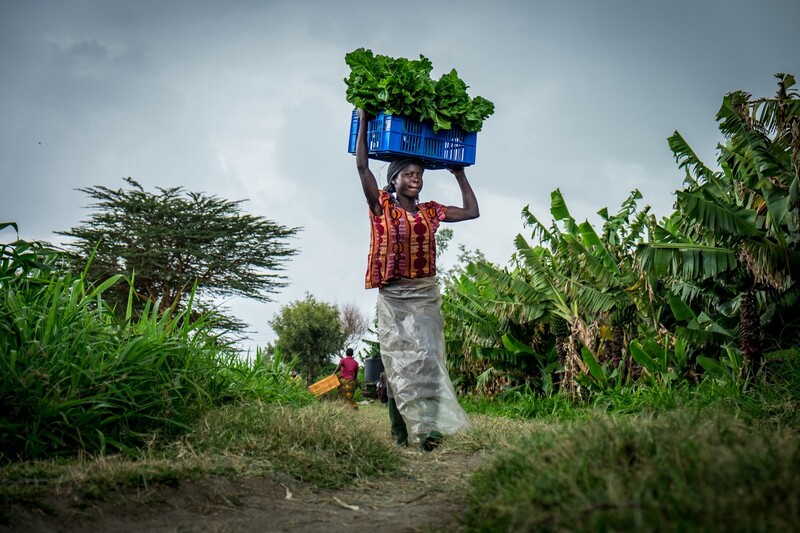 Fortunately, life for Tanzania’s farmers is changing. Export limitations are gone, so they can sell their crops outside their own community. But to escape the vicious circle of poverty and hunger, what is needed now are bigger and better harvests. “Growing crops more efficiently in rural communities means growing the data. Hiber’s LPGAN changes everything, making data connectivity ultra affordable in even the remotest regions. Soil and weather sensors, smart farming apps, drones, cooling facilities and much more can all talk to each other quickly and easily. Creating a fertile environment to grow not just better crops such as modern hybrid vegetables and flower seeds but better ideas to transform the future of farming,” says Pieter van Dijke, CEO Profyta. How? Better crop yields come from better data. With information from soil, light and rain sensors, the performance of seeds and crops can be multiplied many times by planting them at the right time and in the right soil conditions. Then watering, fertilizing and protecting exactly when it is most beneficial. Data also helps farmers protect crops against disease in a responsive and responsible way. Traditionally, crops are sprayed with pesticides to a rigid schedule. Whether they need it or not. Which fails to take account of variable factors like weather, soil conditions and disease. Data changes all that as farmers are alerted to threats and at what levels. They can then protect with exactly the right treatment at exactly the right time. Reducing the use of chemicals and growing naturally stronger crops. 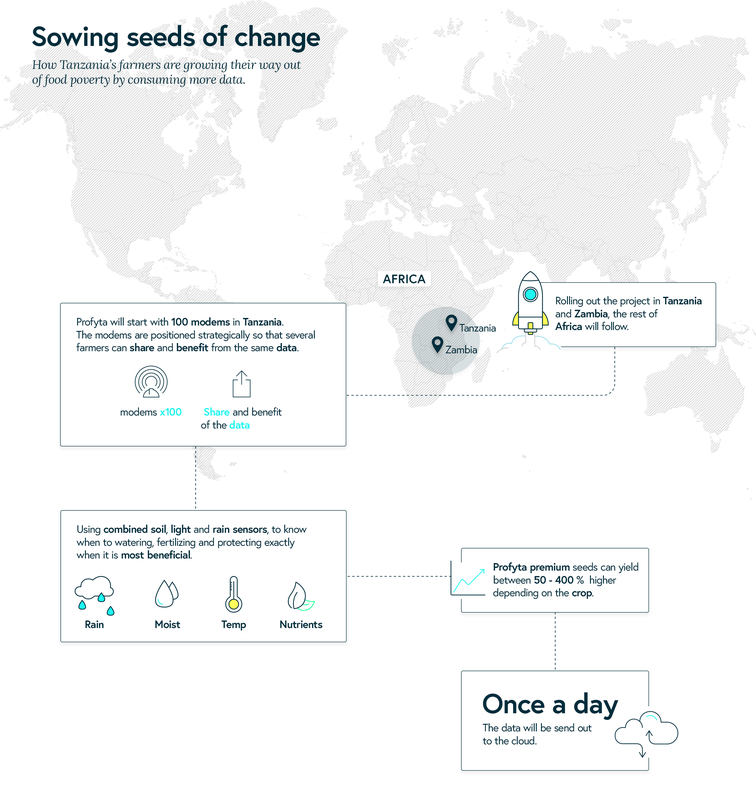 Profyta, a grower of premium seeds, is helping Tanzanian farmers grow their way out of poverty. They provide the invaluable data and advice to maximise yield through their simple ‘Seed as a Service’ business model. Acting on the data and insights from local soil and nearby rain sensors, Profyta regularly advise farmers on how to grow their crops to significantly improve profitable production. What? Profyta will start with 100 modems in Tanzania. The modems are positioned strategically so that several farmers can share and benefit from the same data. The key word here is ‘share’. Profyta needs to analyse data from the soil, light and rain measurements across the whole country. GSM networks only cover 10% of Tanzania, and this is worse when it comes to farmlands, where there is only 1% coverage. And this is where Hiber’s Low Power Global Area Network (LPGAN), will literally change the face of farming in Tanzania. Thanks to nano satellites and modems that have up to a 10-year battery life, Profyta can access a low power, low cost satellite service that has global coverage. Data from rural and remote areas can easily be sent to the cloud, allowing them to predict the best growing conditions. Even better, Profyta can send text messages to farmers, which they can pick up when in town, with detailed advice to maximise their harvest. For both the farmers and Profyta this is a win-win situation. Profyta’s premium seeds can yield between 50–400 % higher depending on the crop. Meaning farmers have a surplus to sell and pay for these premium products. In turn, Profyta knows the more it can help farmers boost yields the more it can charge for premium seeds and its data service. Come rain or shine, the future suddenly looks bright in Tanzania. Who? Profyta is a Tanzanian smart farming company which has been developed by PI Holding; a Tanzanian company owned by the Dutch company Finch Hatton and a Tanzanian partner, that develops and invests in ecological projects across agro, food, water, forestry, energy and technology. Profyta optimizes seeds for East African soil, specialising in seed crops, food crops and related agri-/horticultural technology for the East African region. Helping to develop products and services for the fast-growing Tanzania domestic and regional markets. Their success really is food for thought for the rest of rural Africa. We're Hiber. Bringing global connectivity from ocean to desert, quick and easy.